Easy, healthy recipes even your man will like! 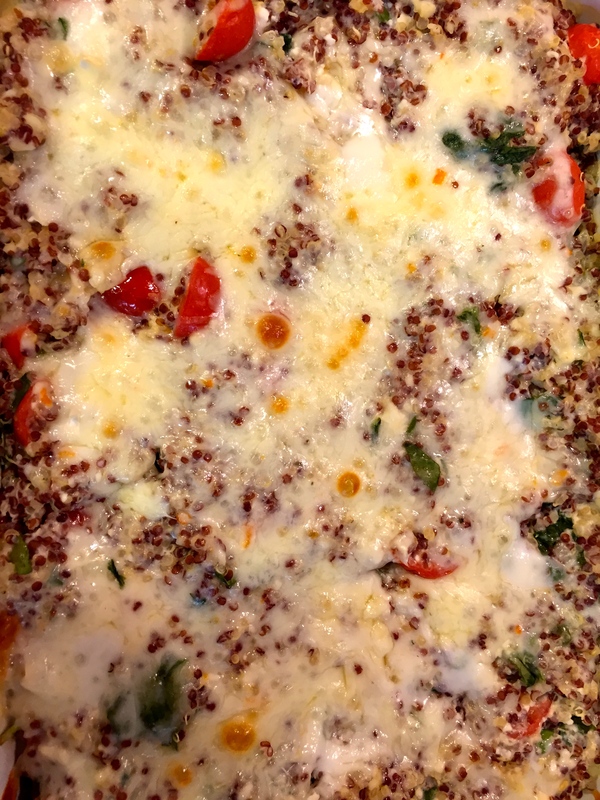 This healthy quinoa bake is so good you won’t even realize how healthy it is! Plus it is so easy to make with simple ingredients that wont break the bank. It’s the perfect healthy comfort food! Prepare the quinoa as directed. While quinoa cooks, dice cherry tomatoes and chop spinach leaves, then set aside. Next, in food processor combine feta, skim milk, garlic, lemon juice, and parsley, blending until smooth. When ready, cherry tomatoes and spinach into quinoa, plus 1 tbsp oil, stirring well. Pour over with feta sauce, then season with onion powder and salt & pepper, combining thoroughly. Transfer mixture to oven safe casserole dish, spreading evenly. Top with mozzarella, then bake at 400F for 15 minutes until top has melted. Immediately plate and serve. 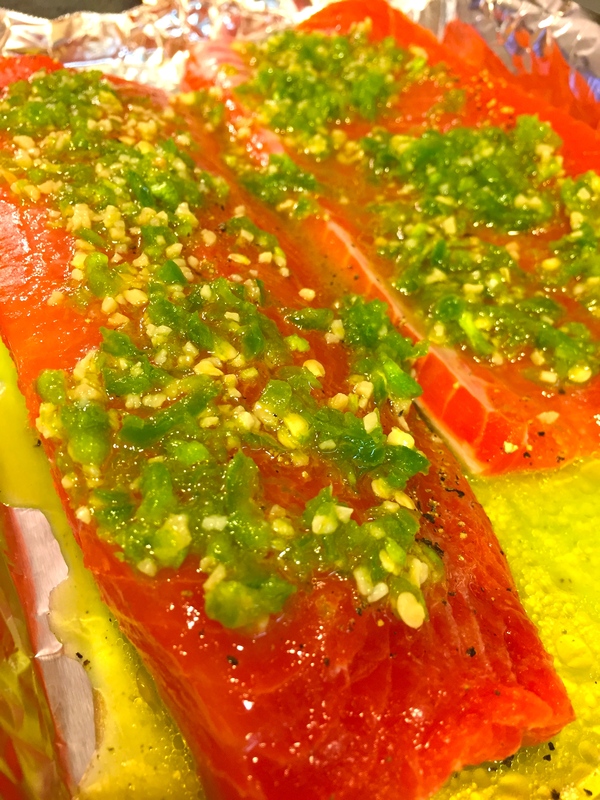 This quick and easy salmon recipe will have your mouth watering! You can adjust the spiciness according to your preferences which is what makes this recipe so versatile. Preheat the oven to 400 degrees F. Line a large rimmed baking sheet with parchment paper or aluminum foil and lay the salmon fillet on it. Pat dry with a paper towel. Whisk the oil, lime zest, and garlic together. Grate the jalapeño and smell for spiciness. If it is very spicy (or you are sensitive to spice) add only half the grated pepper. Otherwise add it all to the oil mixture. Pour the mixture over the salmon fillet and salt the pepper liberally. Bake for 10-14 minutes, until just cooked through, but not dry. Squeeze lime juice over the top and serve warm. I have been really into bakes lately and this one is one of my favorites. The original recipe has you making your own pesto, but with my busy schedule I just used pre-made pesto. The best thing about bakes is that you can add whatever you have on hand to make this dish suitable to your tastebuds. You can add artichokes, different cheeses, a different tubular pasta, really whatever you have on hand. Bring a large pot of water to boil. Add the pasta to the water and cook according to package directions. Reserve 1/2 cup of the pasta water. While the pasta is cooking, chop up the tomatoes and spinach and set aside. Preheat the oven to 400 degrees. Toss the cooked noodles with the chopped tomatoes, pesto, and a little pasta water if it needs to be more saucy. I usually had enough pesto to coat all the pasta. Transfer to a 9×13 baking dish and sprinkle with the cheese. Bake for 10-15 minutes or until the cheese is melted. I made these sandwiches after deciding what to do with leftover chicken from the night before. My husband had just brought home a spicy BBQ sauce so I thought I would try a BBQ chicken sandwich. 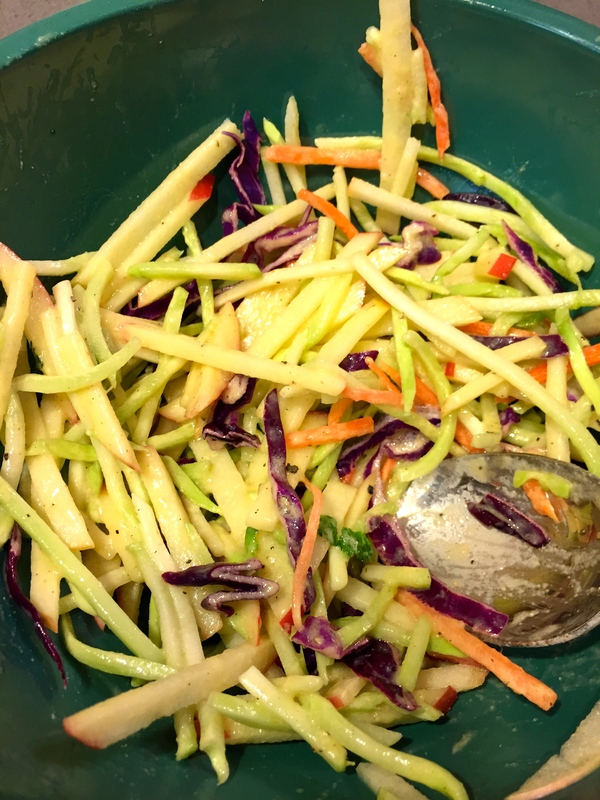 I found this apple slaw recipe and thought I had to add it! The slaw definitely makes this sandwich one of my favorites! 2 cups broccoli, carrots, and purple cabbage, julienned (I usually buy the pre-made broccoli & carrot slaw from my grocery store) * You can really use any vegetable slaw you can find if you are going pre-made. Shred the chicken and mix it with enough BBQ sauce to coat the chicken and some extra to make it saucy. Warm the chicken and the sauce in a small pot. If you are not using pre-made veggie slaw, julienne the broccoli, carrots, and cabbage. Also, julienne the apple. Once the chicken is warmed through, start building your sandwich. 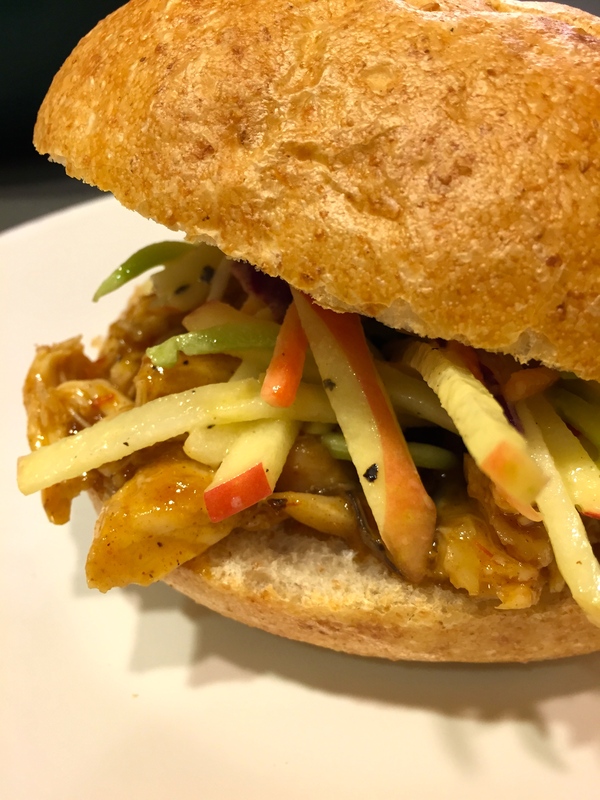 Add the BBQ shredded chicken to the bun and top with the apple slaw. 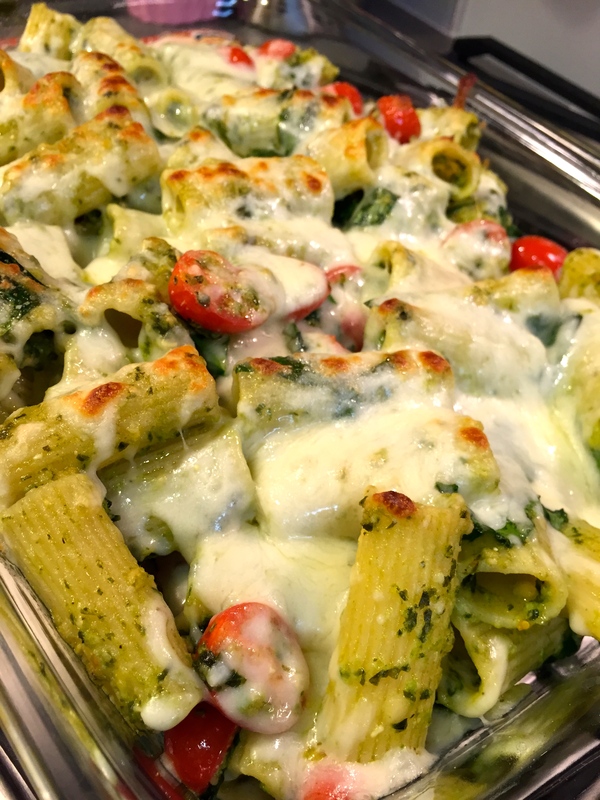 Although this dish takes a bit of time in the oven, it is really easy to assemble and you don’t even have to pre-cook the pasta! 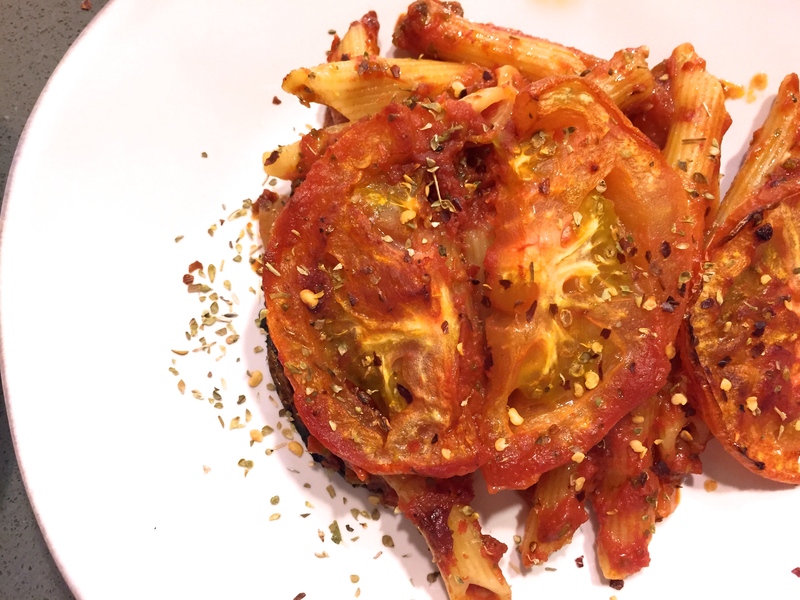 Its a great twist on a simple pasta with red sauce recipe by adding fresh tomatoes! Preheat the oven to 450 degrees F. Butter an 8 by 8-inch glass baking dish. Set aside. In a food processor, blend together the crushed tomatoes and garlic. Pour into a medium bowl and add the uncooked pasta, 1/3 cup olive oil, oregano, salt, and pepper. Toss until all the ingredients are coated. Line the bottom and sides of the baking dish with tomato slices. Pour the pasta mixture into the dish and spread evenly. Arrange the remaining tomato slices in an overlapping layer on top of the pasta mixture, making sure the mixture is completely covered. Drizzle with olive oil. Bake until the tomatoes are slightly crispy and the pasta is cooked, about 1 hour. Remove from the oven and cool for 5 minutes before serving. There is nothing like soup on a cold winter’s night. You can really make this dish your own by adding other veggies, or taking out the veggies you don’t like. 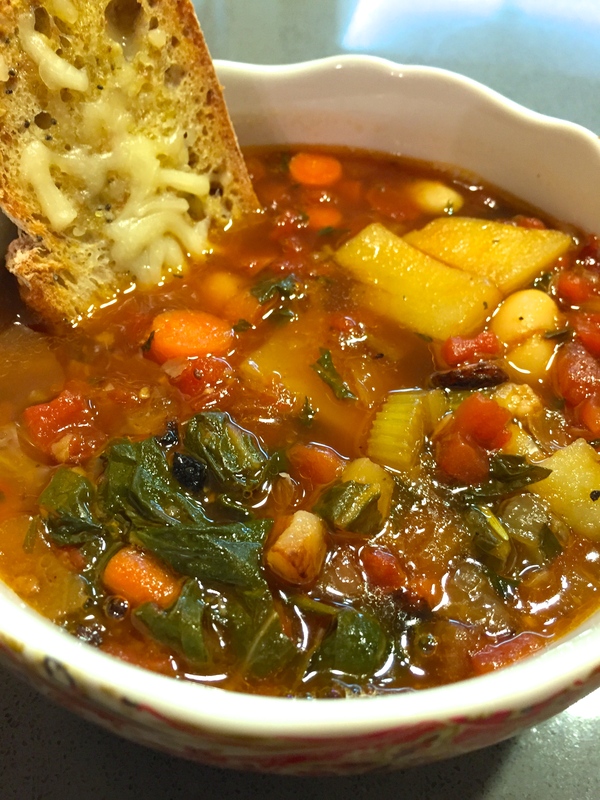 This hearty veggie packed (with pancetta) soup will make your heart warm with how yummy it is! In a large, heavy stockpot or Dutch oven, heat the oil over medium heat. Add the onion, carrots, celery, pancetta, and garlic. Cook, stirring frequently, until the onion is translucent, about 10 minutes. Add the Swiss chard and potato. Season with salt and pepper and cook for 2 minutes. Stir in the tomatoes and rosemary sprigs. Bring the mixture to a boil. Reduce the heat and simmer until the chard is wilted and the tomatoes are very soft, about 10 minutes. In a food processor or blender, combine 3/4 of the beans with 1/2 cup of broth. Blend until almost smooth. Add the pureed bean mixture, remaining broth, and Parmesan rind to the vegetable mixture. Simmer, stirring occasionally, until the potato pieces are tender, about 15 minutes. Stir in the remaining beans and the parsley. Simmer until the beans are heated through and the soup is thick, about 2 minutes. Discard the rosemary stems (the leaves will have fallen off) and season with salt and pepper, to taste. Ladle the soup into bowls and serve. You can leave the Parmesan rind in the soup, just make sure not to eat it!